The parish of St James was created in 1907 as the new town of Clacton-On-Sea grew and developed. 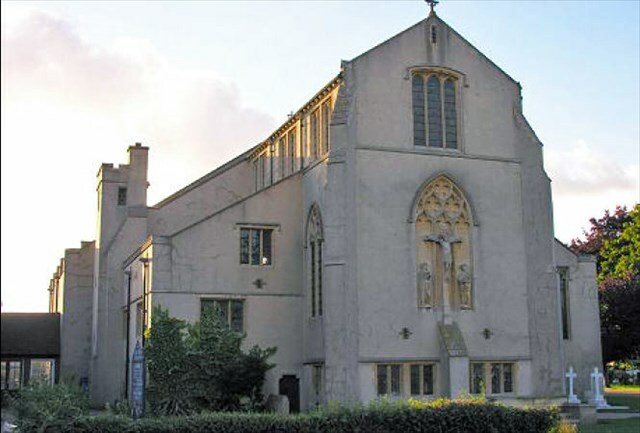 The present building was consecrated in 1913 and The Ecclesiastical Commissioners decreed that a second parish be formed in Clacton providing that this new church would have the more elaborate services associated with the Catholic Movement. The church was originally planned to be nearly twice as large, complete with a bell tower, but the building was never completed to its designs. As it stands today the church can seat approximately 400 people, and whilst the outside seems rather austere, the interior is very beautiful. In addition to the spectacular high altar there are two side chapels, both of which have stained glass windows, an altar, and ample seating for smaller services and prayer groups. Below the high alter are two vestries: one for the vicar and one multipurpose vestry used by the servers, as a meeting room, and as the parish office. The baptismal font was repositioned in 2001 to take pride of place at the front of the congregation. It is a more welcoming place to hold Christenings and to display the wonderful masonry work. The original location is now used as an area for quiet prayer and reading. St James has a strong musical tradition and uses both the New English Hymnal and Celebration Hymns. The interior of St James is complemented by some beautiful stained glass windows. On the north side is the St James window and on the south, a window depicting the resurrection which is quite breath-taking when the sun is shining through it. The churchyard has a grassed area adjoining the road which was planted with 1000 daffodil bulbs many years ago. These still bloom each year at Easter time providing a fine show, and are handed out in small bunches to Mothers at the Mother's Day service. There is ample parking in Vicarage gardens but it can fill up very quickly in the morning. Also nearby is the original vicarage building which now houses St James Doctor's Surgery. Please do not park in the surgery car park as this is not permitted and is reserved for surgery staff. Please take care when crossing the roads, and replace the cache as found.